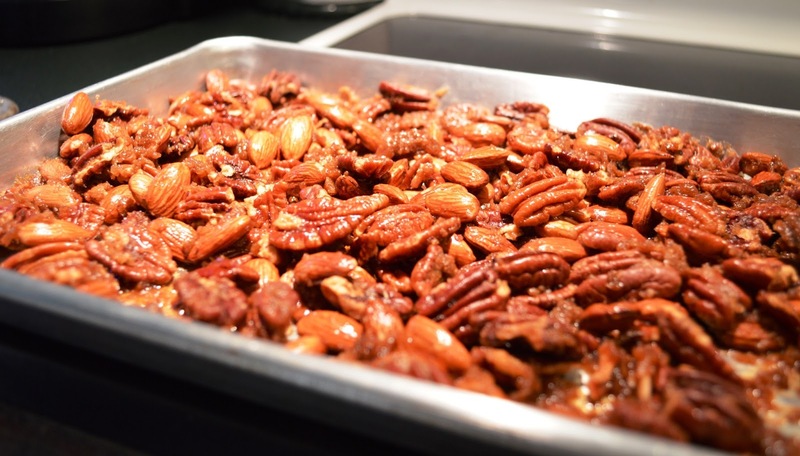 1/2 cup light brown sugar, 1/2 stick butter, 1 tablespoon Creole Seasoning, 2 cups of nuts - I used pecan halves and raw almonds. Combine sugar, butter and seasoning in a pan over med heat, stir till combined and melted. Add nuts and stir to cover. Place in a single layer on a cookie sheet or quarter sheet pan and bake at 350 degrees F for 15 minutes, stirring several times. Allow to cool a bit, sprinkle on a little more seasoning and let cool completely before placing in a sealable container. Good for a few days but not likely to last that long. Lovely with a carbonated drink of your choice - I might have them with a dry Champagne later tonight.